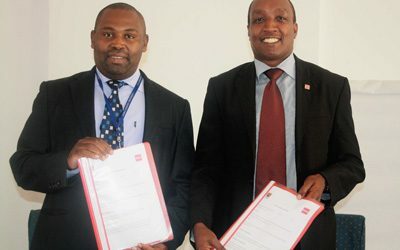 It a great milestone for Strathmores School of Management and Commerce (SMC) as the school entered into an agreement, (the only one of its kind among East Africas universities,) with Association of Chartered Certified Accountants (ACCA) that will see the SMCs 3rd & 4th year undergraduates students get exemptions enabling savings of up to Kshs. 150,000. The Accelerate Programme was launched Friday 28th February at SBS Auditorium on Friday. Strathmore University (a premier university in the region) and ACCA (the leading international accounting body) signed a deal in which Bachelor of Commerce students specializing in Accounting and Finance will receive exemptions in five papers: F1, F2, F3, F4 and F6.This will enable the students accelerate their progression in accountancy and finance as they complete their ACCA course faster than their counterparts. while the Strathmore side was well represented by Dr. David Wangombe and Dr.
Gachenga, the Dean and the Associate dean of SMC respectively. Additionally, the students will also be exempted from registration costs and ACCA will pay for the costs of exemptions on behalf of the students. With this deal, students will not only receive valuable technical and educational support necessary to help them develop skills that employers look for in graduates, but will also make significant savings upon registering for the Accelerate programme. Strathmore University is the only university in Eastern Africa that has been granted the privilege of exempting its Accounting and Finance students from a number of ACCA papers. This partnership confirms the superiority of Strathmores BCom degree in a market that is has very many institutions of higher learning offering the same course. ACCA (the Association of Chartered Certified Accountants) is the global body for professional accountants. Founded in 1904, it aims to offer business-relevant, first-choice qualifications to people of application, ability and ambition around the world who seek a rewarding career in accountancy, finance and management. It supports 162,000 members and 428,000 students in 173 countries, helping them to develop successful careers in accounting and business, with the skills needed by employers. It has a network of 89 offices and centres and more than 8,500 approved employers worldwide, who provide high standards of employee learning and development.